Where were the land areas and oceans of the North American Continent 1 million years ago, compared to their present locations? Was North America always about the same size and shape that it is today? To answer these questions, geologists construct maps of the lands and seas as they existed in past ages. This process of reconstructing ancient geography is called paleogeography (from the Greek word "palaios," meaning ancient). Like a modern-day sleuth, geologists must interpret the clues they find preserved in the rocks. These clues are of two main kinds: the types of fossils contained in the rocks and the properties of the rocks themselves. When interpreted, these clues can give not only direct knowledge about the distribution of the lands and the seas, but also about the natural environment of the area, such as the climate, the temperature and salinity of the water, and the downhill direction of slopes on the Earth's surface. The last item is very important if we are to infer where the mountains and basins were located in the geologic past. The distribution of fossils (skeletons, shells, leaf impressions, footprints, and dinosaur eggs) in rocks of a certain age tells something about the ancient distribution of lands and seas on the Earth's surface. The remains of coral and clamshells found in the very old limestones in parts of Pennsylvania and New York indicate that this region was once covered by a shallow sea. Similarly, the remains of ancestral horses and camels in rocks of South Dakota show that the area was then dry land or that land was nearby. A closer look at these fossils will tell even more. Their distribution identifies the ancient areas of land and sea, and also determines the approximate shoreline. The distribution of living forms shows that thick-shelled fossil animals once lived in shallow water close to shore, where their shells were built to withstand the surging and pounding of waves. Thin-shelled, delicate fossil animals probably lived in deeper, calmer water offshore. Fossil scallops of Cretaceous age from north-central Texas. Living corals on a modern coral reef off Florida (photo by E.A. Shinn). In addition to providing a measure of water depth, fossils can also be used to indicate the former temperature of water. In order to survive, certain types of present-day coral must live in warm and shallow tropical saltwaters, such as in the seas around Florida and the Bahamas. When similar types of coral are found in the ancient limestones, they provide a good estimate of the marine environment that must have existed when they were alive. All these factors -- depth, temperature, currents, and salinity -- that are revealed by fossils are important, for each detail tends to sharpen and clarify the picture of ancient geography. The properties of the rocks are also important clues and are used as guides in reconstructing paleogeography. A few examples will show some of the properties of rocks that are used to decipher the past. Before the 1830's, geologists were uncertain about the origin of deposits of boulders crudely mixed with sand, silt, and clay which cover large portions of Europe and North America. 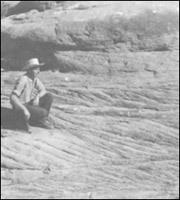 Associated with these deposits were large, striated boulders (some as large as a house) and scratched and grooved bedrock surfaces. Some naturalists had speculated that these deposits originated from debris laid down during the Biblical Flood, whereas others suggested that they were caused by sediment from melting icebergs. Glacial grooves and striations on rocks in Massachusetts. The terminus of the Columbia Glacier, Prince William Sound, Alaska, in 1976. In 1836 the famous naturalist Louis Agassiz spent a summer in the Swiss Alps, where he had an opportunity to examine the glaciers and glacial deposits of the area. From his observations, Agassiz concluded that this blanket of boulders, sand, and clay had been spread across much of Europe by large continental glaciers during a prehistoric Ice Age. Much of what Agassiz saw could be explained only by glacial action. Because a glacier is a solid mass of ice, it moves very slowly, and as it moves, it picks up all sizes of debris, ranging from huge boulders to fine silts and clays. As the ice melts, all the debris is left behind as a layer of poorly sorted material. From the nature and distribution of glacial deposits, geologists have formed a picture of what the Earth looked like during a glacial event. In the same manner, geologists have recognized rocks that were once ancient beach deposits because most beaches are composed of well-sorted sand. The action of waves along the shores of ancient seas washed out the silt and clay and left behind rounded grains of sand, just as those along present shorelines. Offshore, where the bottom waters are calmer, the finer sediment settles as mud. In a general way, the size of the sediment grains shows the direction of slope on the sea floor, because the sandy sediment will be near the shore and the mud will be offshore. This same principle of sorting also applies to ancient rocks; marine sandstones and conglomerates were formed closer to shore than were the finer textured marine shales and siltstones. The same concept of sorting can be used with nonmarine formations, such as river and delta deposits , to determine the direction of paleoslope (ancient slope). 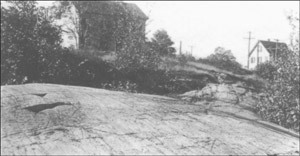 Rivers (like waves) sort the rock debris, leaving the coarser materials near the head of the stream and carrying the finer materials downstream toward the coast. Fluviatile cross beds in Supai Sandstone, Grand Canyon, Arizona. Sketch showing current directions and downstream dip of cross beds. To provide additional information on the direction of flow of ancient streams, geologists study the arrangement of the layers in stream deposits. A close look at many sandstones, for example, shows inclined layers of sand, called cross beds. By determining the direction in which the cross beds are inclined, geologists can tell the direction in which water flowed when the sand grains were deposited. Even today, sands are forming cross beds, particularly in river channels and in shoal areas where ripplelike dunes form across the channel. Like dunes in a desert, these dunes slowly move in a downstream direction. The current carries the sand grains up the gently inclined upstream side of the dunes and deposits them on the steeper sloping downstream side. The inclined layers of sand are deposited on the front of the dune, producing beds with a downstream (downcurrent) dip. Dip measurements from a great many cross beds in rocks of the same age that are exposed over a wide area show a useful pattern of ancient flow direction (paleocurrent). Both sorting and layering of sediments in river deposits are used to determine the location of ancient highlands and lowlands. To obtain a picture of ancient geography as it existed during a particular interval of geologic time, geologists plot the distribution of various kinds of rocks for a given geologic age on a map. Then, by noting the location of the delta deposits, the beach deposits, and the stream deposits, geologists can determine the approximate location of an ancient shoreline that separated land from sea. Fossils, the size and sorting of grains, and the direction of cross beds in rocks are only a few of many such clues, although they are the most useful, that geologists use to reconstruct paleogeography. By using these data, geologists reconstruct pictures of the geography of the North American Continent during each of the various periods of geologic time, such as the Great Ice Age (Pleistocene Epoch), the Age of Dinosaurs (Cretaceous Period), and the Coal Age (Pennsylvanian Period). 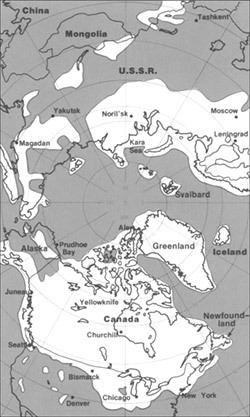 The maximum extent of glacial ice in the north polar area during Pleistocene time. 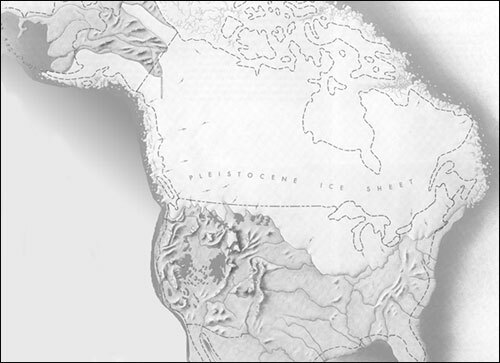 During the Great Ice Age, or Pleistocene Epoch, which began about 2 million years ago, large portions of Canada and the Northern United States were blanketed by the continental ice sheet, as shown on the map. Much of the rich soil of the Midwest is glacial in origin, and the drainage patterns of the Ohio River and the position of the Great Lakes were influenced by the ice. The effects of the glaciers can be seen in the stony soil of some areas, the hilly land surfaces dotted with lakes, the scratched and grooved bedrock surfaces, and the long, low ridges composed of sand and gravel which formed at the front of the ice sheet. Increased rainfall in the area south of the continental ice sheet formed large lakes in Utah, Nevada, and California. Remnants of these ancient lakes still exist today as the Great Salt Lake, Pyramid Lake, Winnemucca, and many others. Ancient shorelines for these old lakes can be found along the sides of mountains, as for example, near Provo, Utah. The tremendous size of the ice sheet further influenced paleogeography by lowering sea level about 450 feet below the present level; the water contained in the ice and snow came from the oceans. The continental shelves around our continent, as well as the other continents of the world, were above water and, as a result, some States such as Florida were much larger than they are today. The shoreline deposits and shells at the edge of the Continental Shelf, in waters to 450 feet deep, are evidence of this marked drop in sea level during the Pleistocene. Generalized geographic map of North America in Pleistocene time. Eighty million years ago, during the Age of Dinosaurs, the geography of North America was very different from that of today. Mountain ranges have changed considerably since this, the Cretaceous Period. The Appalachian Mountains were probably lower and less conspicuous as a source of sediment than they are today; apparently they supplied appreciable amounts of coarse sediment only in the Southeast (Tennessee, Alabama, Mississippi, and Georgia). 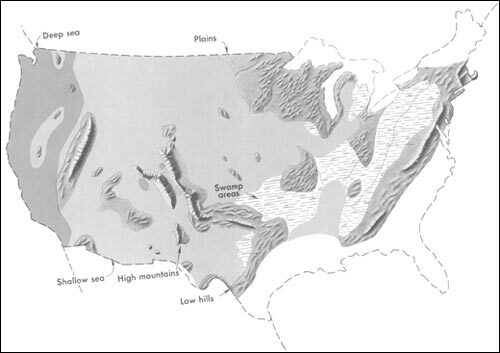 The Rocky Mountains, as they are today, did not exist; instead a giant trough in which marine sediment slowly accumulated occupied this part of the West. Shallow, warm inland seas covered large portions of the Southern and Western United States, as shown on the map. Large portions of California were under water, and in eastern California, Nevada, Arizona, Idaho, eastern Oregon, Washington, and Alberta, a belt of the Earth's crust slowly rose to form a new mountain range. Details from this vast highland extended eastward into Utah, Wyoming, Colorado, and New Mexico. 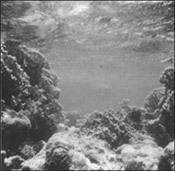 Still farther east, Kansas, Nebraska, and adjacent States to the north and south were covered by warm, extensive, but shallow seas in which beds of limestone slowly formed. Generalized geographic map of the United States in Late Cretaceous time. The Cretaceous Period marked the last extensive covering of the North American continent by the sea. Since then, sea level has dropped and the continent has gradually emerged to its present size and shape. As we move backward in time from the Great Ice Age, to the Age of Dinosaurs, and then to the Coal Age, the contrast in the distribution of land and water from the ancient past to the present becomes more dramatic. The map shows the outline of the United States as it looked during the Pennsylvanian Period some 300 million years ago. It gives the appearance of reversing present-day geography. A highland which lay to the east, south, and north supplied much of the sedimentary debris that was spread over the midwestern part of the United States. The Midwest was mainly a low swampy area in which scouring rushes and fern trees grew in profusion. Sediment was carried into the region from deltas to the east. From time to time, the level of the sea fluctuated -- possibly because of glacial conditions in the Southern Hemisphere. Swamps were flooded, and forests were destroyed. Slowly, layers rich in tree stumps, spores, branches, and leaves were deposited. Later, heat and pressure changed these layers into the coal beds that are so extensive in Illinois, Kentucky, Pennsylvania, West Virginia, and Tennessee. To the west, marine limestones, sandstones, and shales accumulated in shallow seas whose vast expanses were dotted with shoals and islands. Some of the very large islands were formed by the buckling and uplifting of parts of the Earth's crust. Restoration of a coal-swamp forest in Pennsylvanian time (photograph courtesy of the Field Museum of Natural History). The maps depicting the Pleistocene Epoch and the Cretaceous and Pennsylvanian Periods give a simplified picture of the changes in the size and shape of the continent. Examinations of older and older rocks show that in the earlier periods, the land areas of the North American Continent were much smaller and were largely confined to central and northern Canada. 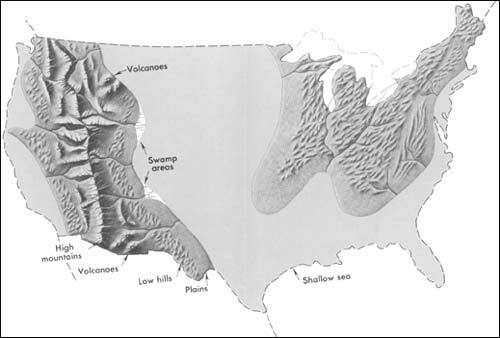 In fact, during much of geologic time, large parts of the continental United States were covered by shallow seas in which lime, mud, and sand accumulated. The maps show that the mountain ranges have buckled the Earth's crust from time to time. Most of these ranges were located along the eastern and western margins of the present continent, and erosion of newly formed highlands contributed sediment toward the center of the continent. Eventually, these ranges were worn down (as in the Appalachian region during the Cretaceous Period). The process of mountain building continued, however, either by renewed uplift and erosion of old mountain ranges such as in the Appalachians, or by building new and youthful mountains such as those that make up the Coast Range of California. The appearance of our continent has been continuously changed by this complicated sequence of mountain building, erosion, and deposition of sediment in slowly sinking troughs, followed by more crustal movement. These changes are still going on today, although they are so gradual that only occasionally do we become aware of them. One dramatic effect of change is the jolting movement of a portion of the Earth's crust during an earthquake. Another is the fire and devastation associated with the building of a volcano during eruptions, like that of Mount St. Helens in 1980. Such spectacular actions by nature in building continents are combined with the less noticeable processes of erosion and deposition that have gradually shaped and changed the face of the North American Continent and the entire planet throughout geologic time. 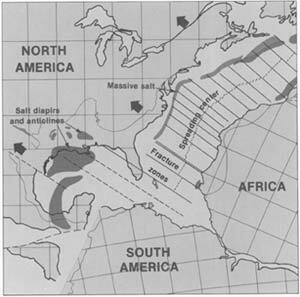 In the early stages of the development of the U.S. Atlantic continental margin, North America moved away from Africa, Europe, and South America. Not only has the geography of continents changed slowly over milleniums but so has their position. About 200 million years ago, a supercontinent (called Pangea) linked North and South America, Africa, and Europe. One of the exciting new advances in geology since the early 1960's has been the realization that the continents and substantial parts of the bordering ocean floor have slowly moved with respect to each other and that the outermost layer of the Earth's crust is made up of lithospheric plates. 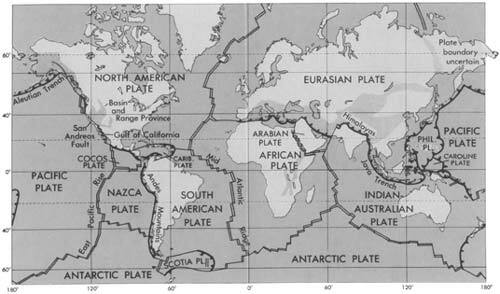 As these thin plates of oceanic and continental crust move, they change the positions of the continent; the theory that describes their formation, movement, and destruction is called plate tectonics. Lithosphere plates of the Earth. Scientists of the U.S. Geological Survey, together with all geologists working in the many fields of research, continually add to the fund of information about the Earth -- its origins, its mineral resources, and the processes that change its crustal features. Studies of the physical and chemical properties of rocks are coupled with studies of the development of life in its myriad forms to provide the data which, when fitted together, lead to a better understanding of the successive changes that have occurred on the Earth. These concepts, like the maps shown in this leaflet, are "incomplete" because much information has yet to be discovered. But as geologists' knowledge of the Earth increases, the record of its history has become clearer and more meaningful. or visit http://geology.usgs.gov/gip.html for a list of online GIPs. As the Nation's principal conservation agency, the Department of the Interior has responsibility for most of our nationally owned public lands and natural resources. This includes fostering the wisest use of our land and water resources, protecting our fish and wildlife, preserving the environmental and cultural values of our national parks and historical places, and providing for the enjoyment of life through outdoor recreation. The Department assesses our energy and mineral resources and works to assure that their development is in the best interests of all our people. The Department also has a major responsibility for American Indian reservation communities and for people who live in Island Territories under U.S. administration.